Ankara Styles #432: Tips On How To Look Your Best In Ankara! 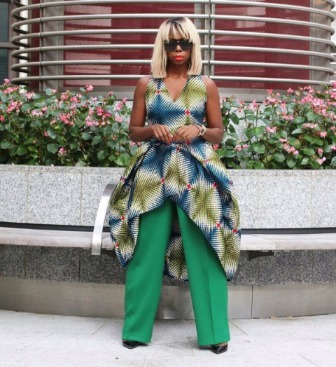 Ankara fashion is here to stay! I can’t emphasise that enough. It takes effort, good tips or ideas to get you to look good, smart and fabulous in your outfit. African print fabric will always be in trend and now that the demand is high, both local and international designers are finding new ways to reinvent their works with it. Remember how Stella McCartney recently used this African print for her recent collection? Looking away from the fact that she used our prints, her designs were just fabulous! She collection was for the funky, chic and classy female. A model on the runway wearing Stella McCartney’s SS18 Piece. To have that luxe look like your fave celebrities, here are simple tricks to turn your basic Ankara fabric to something chic and haute. Pay Attention To the Details! I can’t have my fabric transformed into a basic outfit without adding details. Details give that personality to your appearance. It’s the little drama on your clothes people admire or can’t take their eyes off it. Details can be in the hand/sleeves, waist, neckline, etc. A simple top becomes haute and luxe with the exaggerated sleeve and ruffle details. It’s not all just about the dress, jumpsuits looking good on you. Be versatile with your outfits. Mix your outfit with that colourful trousers, skirt or blazer. I’m especially in love with this outfit altogether! Sade mixes her asymmetrical hemline dress with a pants. Seems the mixed print trend is just the “golden buzzer” you need from basic to whoa! Funny enough this trend has been on for a while but has only been publicly “recognised” if I must say. Everyone is mixing print and just any two African print goes well if the style permits. It’s really easy to get your A-game on if you know and practice these simple tips and tricks to going from level 1 to 10 in your Ankara game. Enjoy! Lover of fashion & chaser of trends. For more, check out IG;@thelazyoutfitter	View all posts by Vickie O. Watch This – 9 Different Eyeliner Looks To Try! Daily Inspiration: Love Rules The World!